This shows the beginnings of collectable and uncollectable map specials, including wells (the rocky thing in the middle) and energy tabs (gold stars). Here we find the red and blue axes squabling over a well which is churning out some energy tabs every 2 turns. 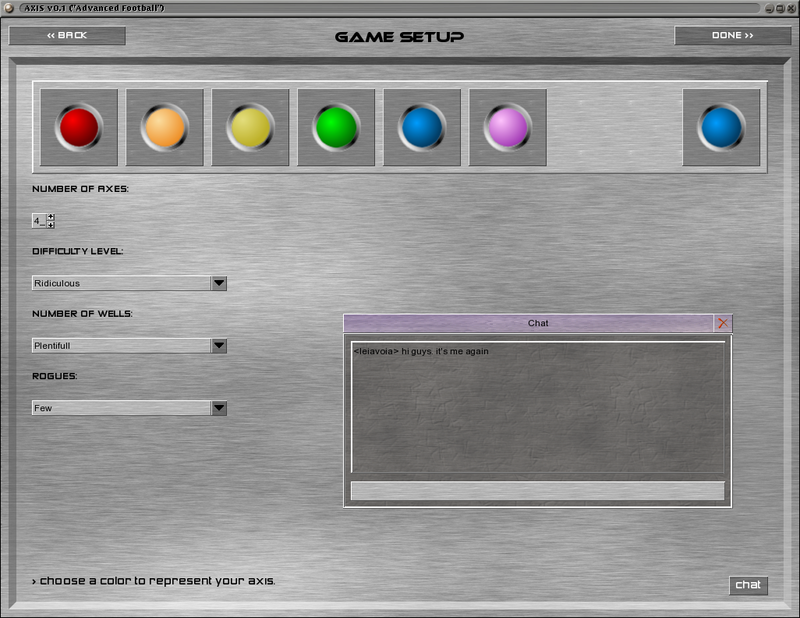 Nothing fancy, but here is a working draft of the setup screen. You'll see this before setting up the map and after starting a new game or getting hooked up for a multiplayer game. 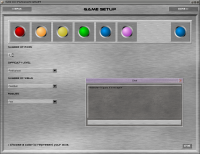 Players choose their axis color here and the host can also change the game settings. 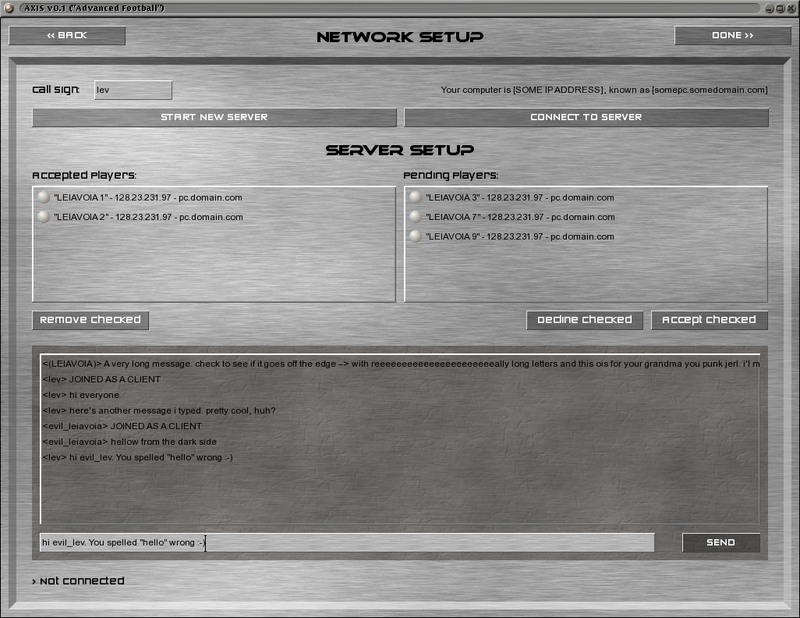 This is the networking screen in progress, minutes after getting in-game chat working (one-way) between two instances of the program. 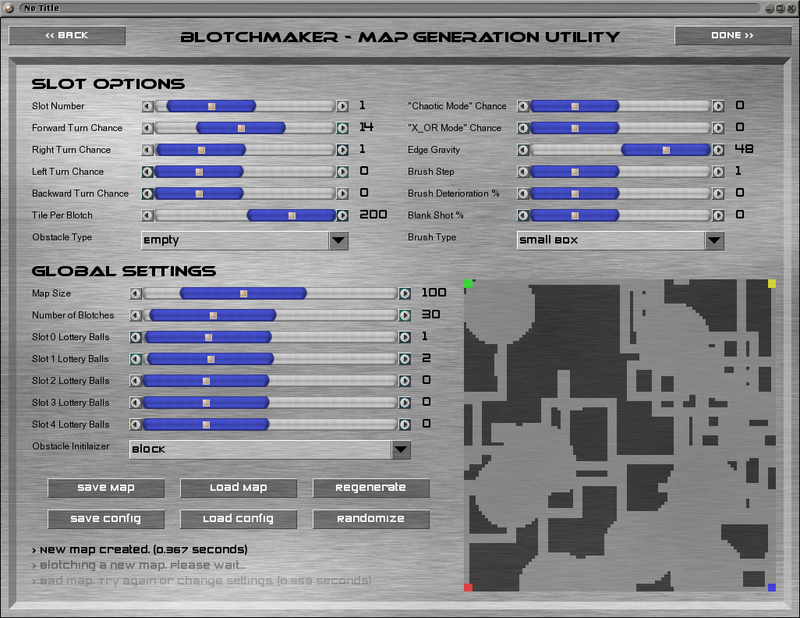 This is the latest version of BlotchMaker with a pretty new face to it. In this shot, brush and obstacle types have not been implemented, so the maps it makes are kind of ho-hum, but by golly, it works! This is the startup page in all its first-draft glory. Not too bad, really. 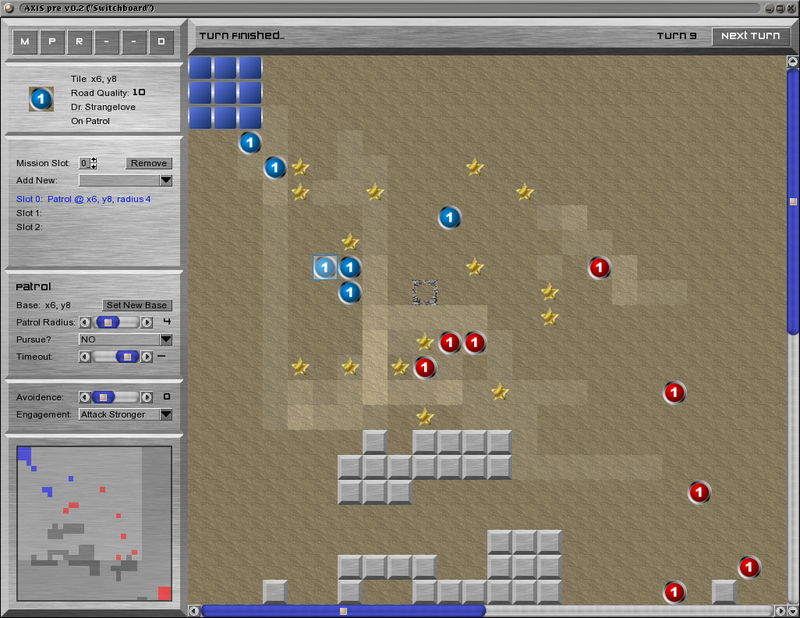 AXIS is a computer game currently in its alpha design and coding stages, being developed right here. 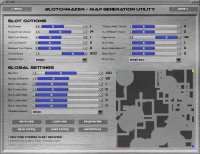 It is a turn-based strategy game with an abstract/geometry theme (shapes and colors instead of knights or battlecruisers). 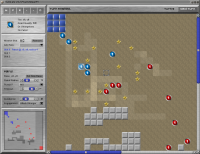 It uses heavy AI elements on several levels. When complete (if ever), AXIS is intended to have 4-player maximum simultanious multiplayer and also featuring robust enemy empire artificial intelligence. For a more complete description, please read the conceptual overview. You bet! We need help in programming, graphics, animation, and a lot of design. But above all, Comments, criticism, suggestions, and compliments are the most welcome on the discussion board. We'll take anything if you are willing to volunteer. In the future we will need beta testers. Anyone with Windows programming experience is also especially welcome. 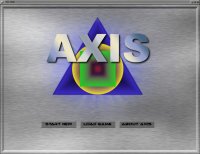 Can I Buy Or Download AXIS? No, it's not done yet! We'll make milestone release downloads available when they are hit. In the meantime, you might be able to poke around the CVS directory. When and if the game is complete, it will be an open source, cross-platform game which should be released free under the GPL license. For anyone new coming here, please note that the AXIS project has been permanently mothballed since the last post. Although there is a chance that i may pick it up again in the future, i am more interested in my other project at the moment. If anyone wants to pick up AXIS, you are more than welcome to do so, just contact me about CVS. To be blunt: I'm getting a bit tired of programming AXIS. TBS games are a bit low on action and tend to feel slow. To make it worse, i've run into some sticky game-design problems (again). AXIS is shaping up nicely, but i am leary of it's final fun factor. There are also AI technical issues which i have yet to figure out. So... I'm taking a break for a while. Forever? Probably not. Will AXIS ever get finished? Mmmmmaybe... 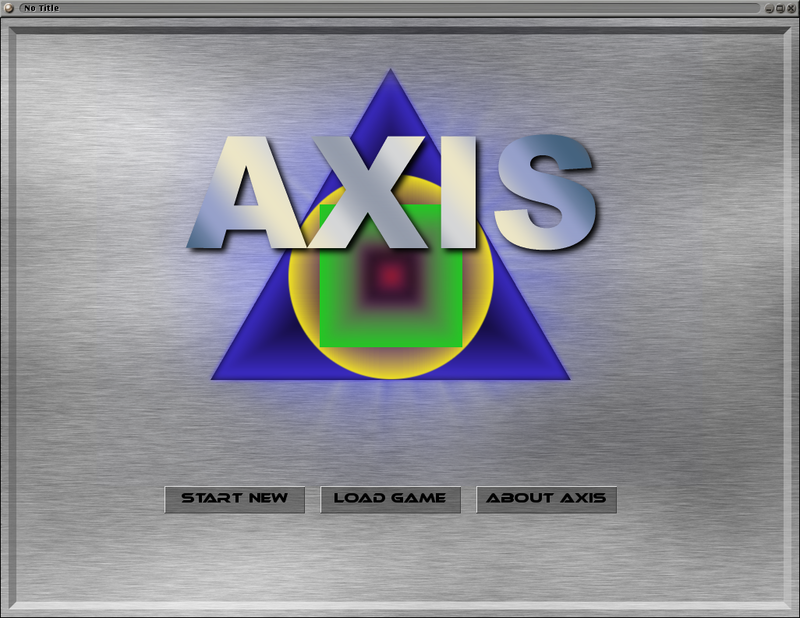 But keep in mind that AXIS is my first major programming project of any kind (save web development projects). The code could be much improved if i could do it all over again and it just gets more and more complicated the bigger it gets. There are about 4-5 other game projects i'd like to do besides or after AXIS. I've taken the least likely but most accessable of the bunch and have been toying with a background story, basic features, and more importantly, cool explosions! >:-D. Basically, it involves an alien "zoo" space craft and some guys with guns trapped inside. It feels a lit like metroid (or will, if done). 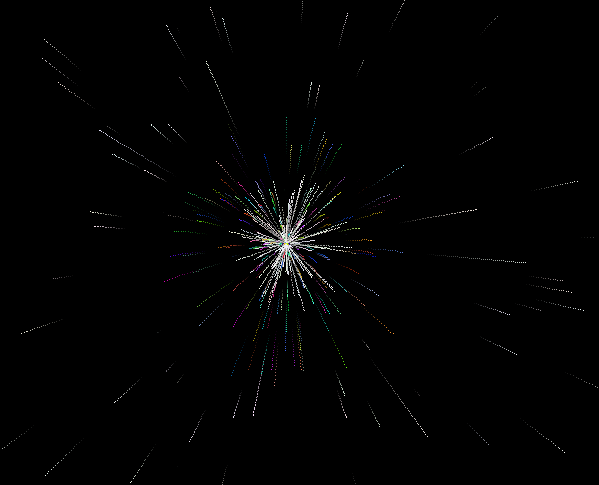 I've been building a basic rendering engine and particle system as a way to learn about action games. I'm also dabbling in OpenGL programming but it's use in the project is questionable. 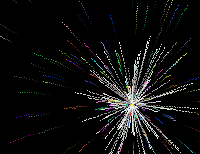 For now, i have as many explosion types as i do number keys and i can easily spend several hours just blowing things up on the screen :-) If anyone would like the (very easy to compile) code for the particle system, please email me at "leiavoia" at this domain. A screenshot is posted, but of course, looks horrible as a still shot. There is currently no website for the new project. If it develops into something substantial, i'll get something up. In the meantime, that's what i'll be working on until i feel like getting back into the much heavier logic that AXIS requires. The Defense mission continues to be refined. It has some problems in that the defending pods often get in the way more than they help out. For instance, when travelling through a tube with a defender in the front, the defending pod will block the defendee's forward path which fools it into thinking the it cannot move that way and procedes to go back the way it came. If there were two pods, one on each end inside the tube, the defendee would not have anywhere to go, being blocked on both ends. The Defenders are too stupid to realize this and i've not figured out any good solution to the problem of pod-blocking. However, i did figure out how to speed up the map window redraw. I switched from using PNGs to BMPs (which have no alpha channel). This effetively speeds up the redraw time by about x2.5. I also added a better mouse cursor select box with full-screen cross-hairs. It's much better than the old system. It's also very fast. Although it took 2 or 3 days to knock out, i finally got the DEFEND mission programmed. Pods assigned the Defense mission will try their best to stay in user-specified formation relative to the defendee and the defendee's current movement path. If for instance, you tell the defender to stay on the defendee's left, it will try to stay on the left as oriented to the direction the defendee is actually moving in which is pretty cool. It's other job is to intercept potential enemies, but not just anyone. It must select targets based on how much of a threat they are to the defendee. Targets are weighed across 6 different fields including proximity and size. As well, the defending pod will actually track the movements of all enemies in it's area and will analyze them to determine who (if anyone) is moving towards the defendee, thus posing a threat. The longer they get closer to the defendee, the more obvious is becomes that they are on an intercept course. You can assign multiple defensive pods to another friendly pod to assure it's safe arrival to wherever it is you need it to go. Nearly forgot to mention: March 2 was AXIS' first anniversary! With 2 milestones behind us and a good way through a third, this project should be "done" in a year and a half or less. I'm not sure if that's good news or not, but the 1-year anniversary sure is! A new screenshot under the title "I Spy" is up showing off more visibility engine features. After more than a week of illness, i got around to working on the visibilty engine. It now works, but is somewhat slow and could bog things down if there are many pods in play. Since i do most of my testing on an AthlonXP 2500, it may be significantly worse on lesser hardware. But optimization is for another day! The map now has a fog of war that can only be removed by scouts. All pods have a visibility circle that is line-of-sight checked as well so you can only see map specials and enemies if they are within the visual range of any pod on the map. If they are behind a wall, you will not see them and they will (probably) not see you either. Visit the News Archive for older news.